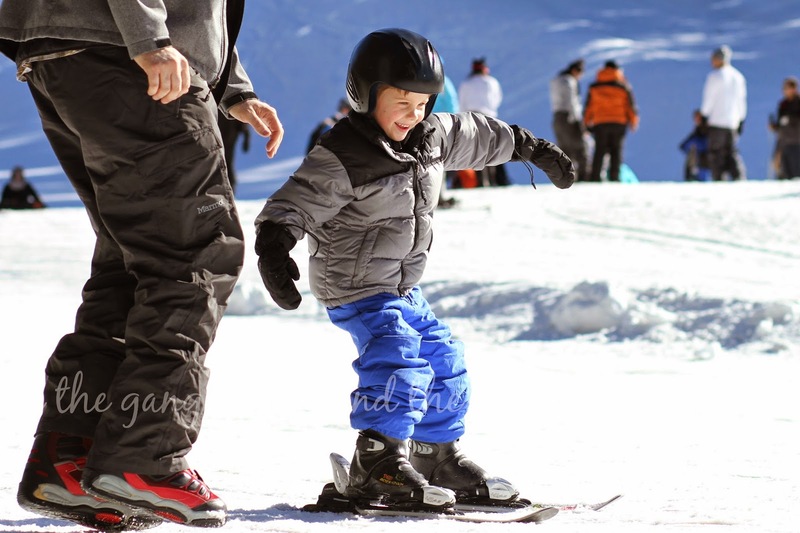 Ian has been wanting to take Connor up skiing for a while now. 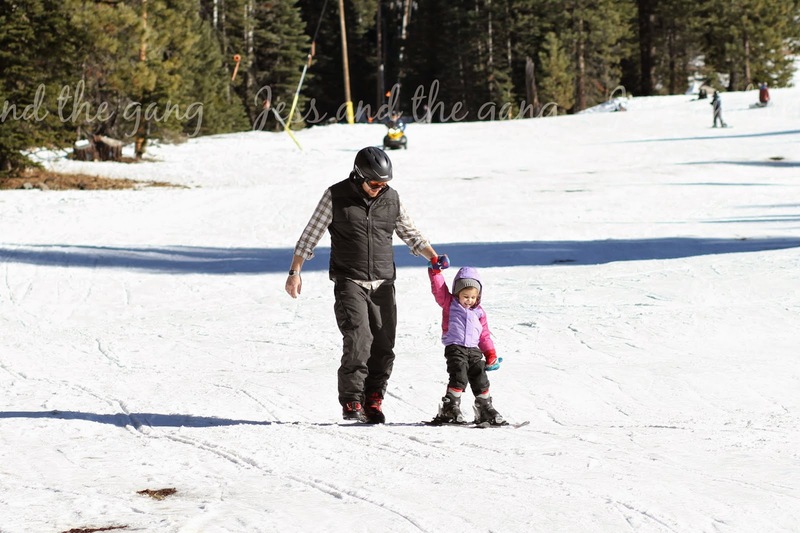 I was always put off with how much it would cost just to see if our kid would be ok with skiing, let alone how long he would last. 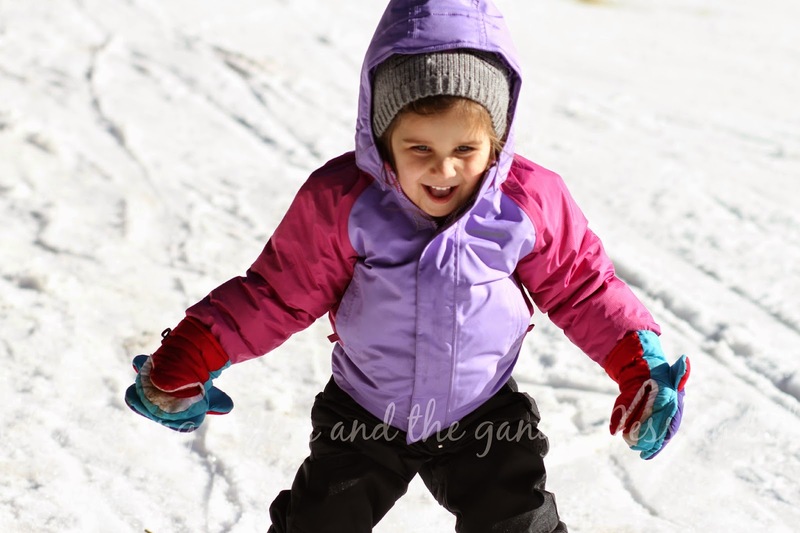 Well, we found out a friend took their kids up to our local ski resort and hiked the bunny hill with their kids, thus it was free. So, we decided to do the same. On the way up, we stopped and rented skis and boots for $15. When we got to the bunny hill, it was obvious we weren't the only people doing this. Isla and I found a place to cozy up in...a place for me to sit (actually I spent most my time taking pictures or making sure Isla didn't hurt herself jumping off boulders) and a place for her to play with the snow. Ian headed up the hill with Connor. Connor's first trip down the hill was a huge success. He had a big smile on his face and it never left the whole time we were there. 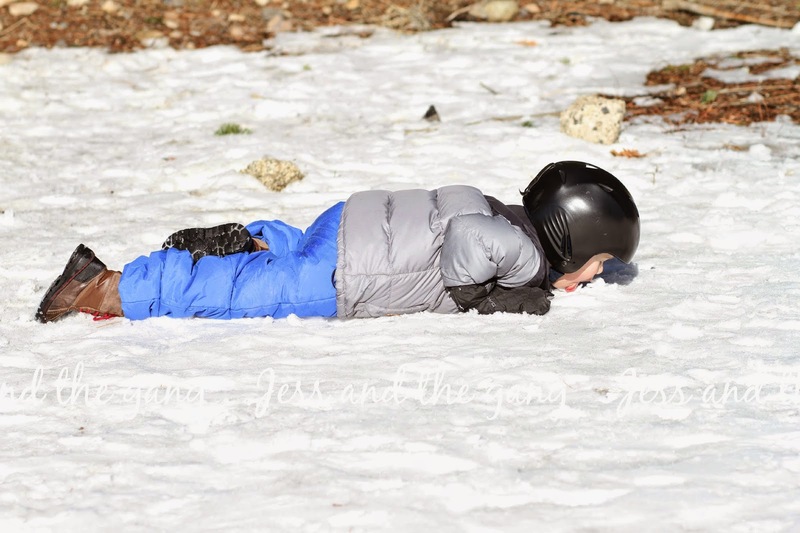 He never cried or complained when he fell...he just used it as an excuse to eat some snow. He actually didn't even fall his first couple runs, but the more tired he got (though he never admitted to being tired until the walk back to the car) the more he fell. And, the funny thing was, he skied in the direction he was looking. So if he got distracted by other people, he just skied right toward them. 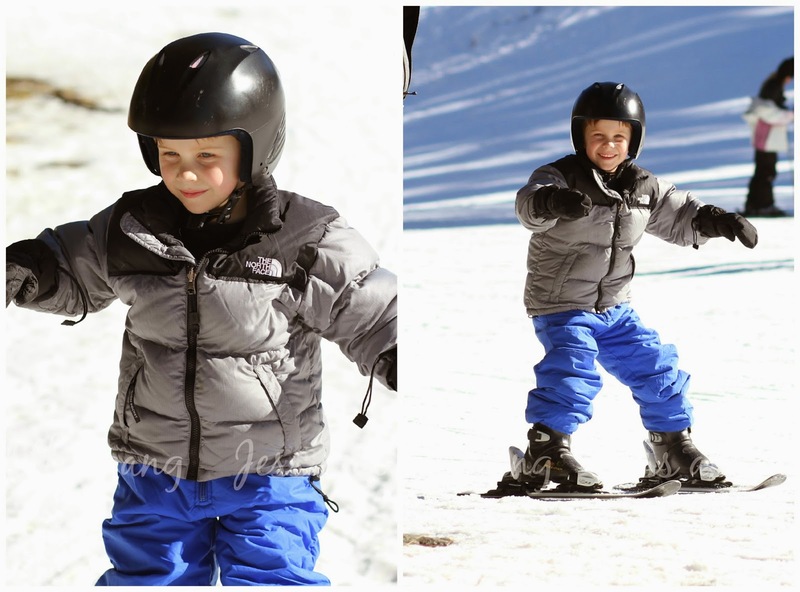 The whole experience was really cute and fun and next time we are planning on putting him in ski school. 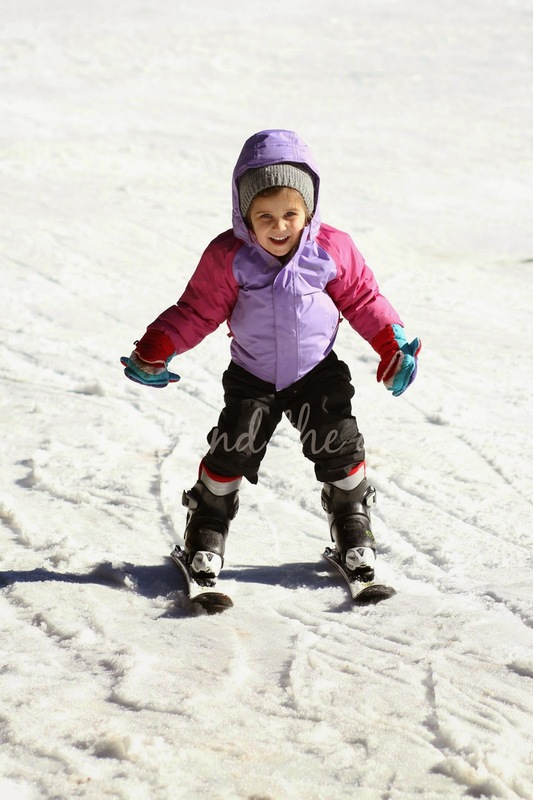 Isla quickly decided she wanted to try out skiing too. So, we gave Connor a break and let her use his skis and boots for a couple runs. Though she didn't get the concepts as well as Connor (pizza pie, french fry anyone?) she still had a blast. She was a bit lazier than Connor, so Ian would actually carry her up the hill. When the kids weren't skiing, they were playing in the snow on the side of the run. Connor spent his time eating the snow...using his mouth, not his hands. Isla ate some as well, but she used her hands. She was actually more interested in the various rocks to climb on and sticks to play with to eat too much snow. Girlfriend loves her some being outdoors and playing! 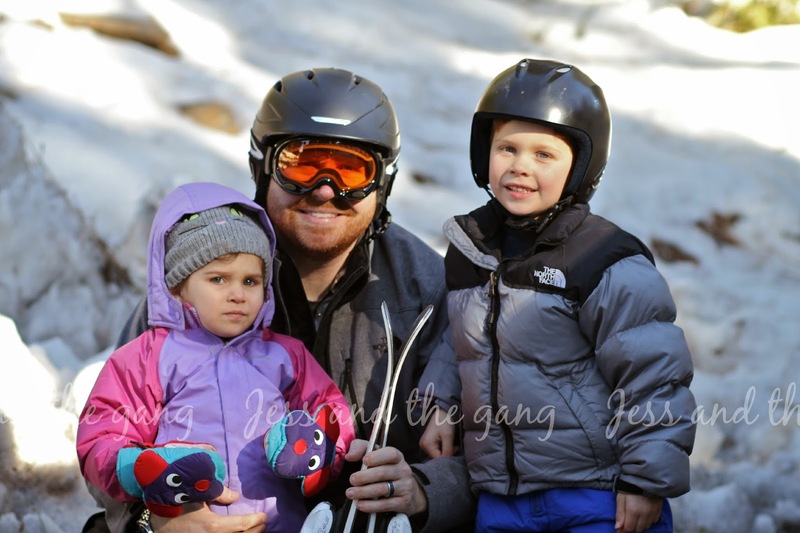 It will be fun to watch our kids develop a love of snow and skiing, as that is something Ian really enjoys doing. And, well, once upon a time I really enjoyed it too. Now, I am just afraid of falling and breaking a hip or something because we all know I am not getting any younger! It actually was more fun and less work than I expected. You should totally take your boys! Pure awesomeness. 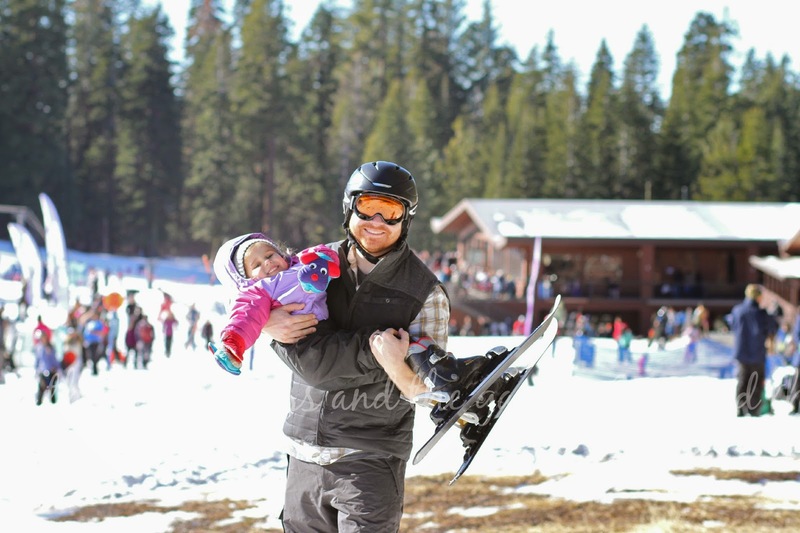 My hubby used to be a huge skier, and he tells me that he can't wait to get our kiddos on the slopes!